It’s that time of year again! Summer is in full swing, and you know what that means for me? Camping! Yes! One of my favorite Summer evening activities is chilling with friends and family around a campfire! I even kind of like the campfire smell that soaks into my hair (by day 3 of trying to wash it out, it’s a little annoying though). 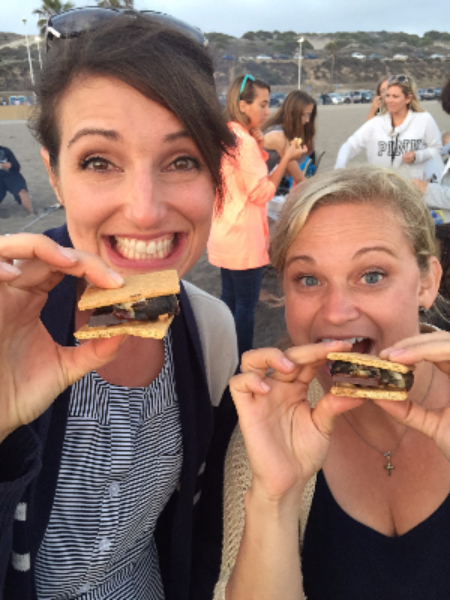 As a kid, my favorite campfire treat, was of course, the classic……S’mores! I loved everything about it! From the hunting for the perfect roasting stick, to roasting the marshmallow to the perfect golden brown….and sometimes catching it on fire for the crunchy burnt taste….to smashing it between the two graham crackers so that the chocolate melts just right! Ahh, I loved them. But of course, it is not the healthiest treat. Regardless, I love it, so I choose to partake in at least one when sitting around a campfire because it feels good to not only enjoy it fully with friends and family, but connect back to my childhood as well. 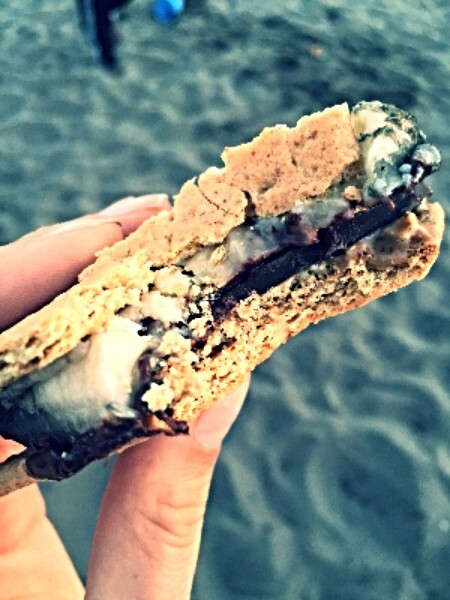 BUT THEN, last summer, I started thinking…..How could I make a Healthy Version of the S’more? I had an idea…..Banana! 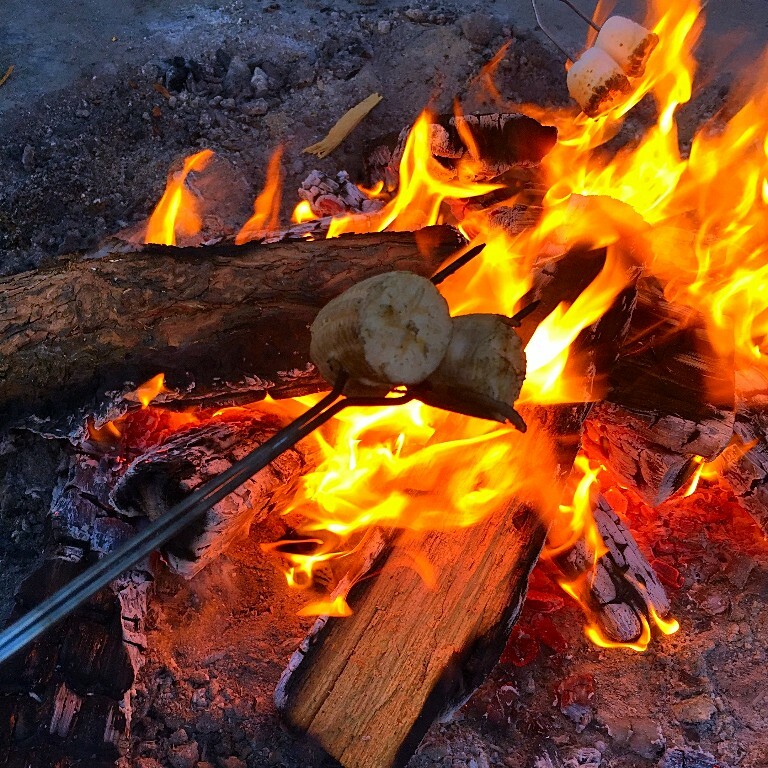 Replace the marshmallow with a banana…..hmmm, this could work. So I tried it! Now it doesn’t get to that beautiful golden brown like the marshmallow, but roast it for several minutes….you will notice it changes color slightly. I also swapped the classic Hershey’s Chocolate with 70% or higher Dark Chocolate (to get all the benefits of the cacao…..magnesium! I love some magnesium!). Picked up some 80% Dark at Trader Joe’s. To add a little extra “yumminess” to it, I decided some Raw Almond Butter slathered on the graham cracker. This is a must! Got that from TJ’s too….CRUNCHY of course! . And of course, the graham cracker…..I looked for graham crackers with the cleanest ingredients I could find. I found one at Whole Foods and if you are gluten free, I know there are some gluten free graham crackers out there. It is so incredibly yummy! A great way to still enjoy my favorite campfire treat, but “healthify” it a little bit! Here is a picture of my friend Laurie and I, with our first experimental batch. I pretty much listed the ingredients here, but If you want the proper recipe for these babies, you can click here for my original blog post. I hope you enjoy my “Healthified” S’mores as much as I did. Let me know if you try it, and what you think! Continue to have an amazing summer and remember, if you need support with reducing stress and increasing energy through nutrition, so that you can live the life you imagined, I am here.